The results of 10 years of Research and Development. 1. Strong and healthy hair, prevents alopecia. 2. More shine due to the increase in keratin. 3. Eliminates odors produced by tobacco, cooking food, or by products derived from other professional activities (catering, butcher, fishmonger, etc.). 4. Reduces hair's fat and clean the hair from root to tip. 5. Prevents dandruff from causing itching and redness of the scalp. 6. Flexibility and softness of the hair thanks to this natural shampoo. Ozonized extra virgin olive oil provides all the benefits of olive oil becoming a powerful ally for our scalp: it has an antimicrobial effect, activates local antioxidant mechanisms, promotes healing, improves oxygen metabolism, increases the flexibility of red blood cells, increases the production of 2,3-diphosphoglycerate responsible for the release of oxygen to tissues, modulates oxidative stress and reacts directly with unsaturated fatty acids that are transformed into water-soluble compounds. For oily hair (or greasy hair). 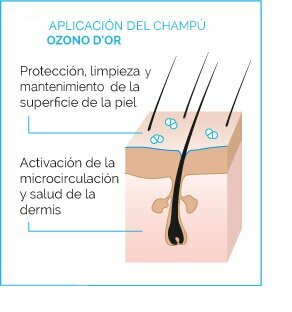 Seborrheic problems, mycosis, bacterial infections, dryness and even prevention of alopecia. Semisolid preparation intended for application to the scalp followed by rinsing with water. Formulated by two non-ionic surfactants of natural origin, thickener to achieve a viscous texture, in addition to purified water as an aqueous vehicle, humectants and extra-ozonized virgin olive oil. Apply enough shampoo to cover all the hair. Perform massages obtaining more amount of foam to improve the absorption of ozone in hair. If necessary, apply again shampoo. Leave for a few minutes to get all shampoo benefits acting on the different hair-associated problems. Rinse afterwards with water. You can use it as many times as you consider necessary. 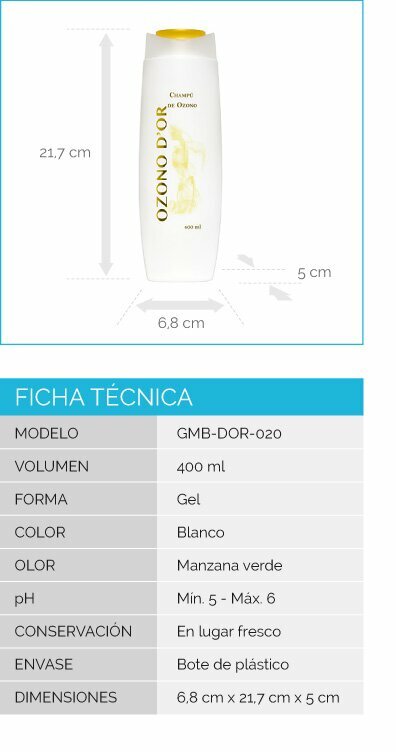 Ingredients: Aqua, Ozonized Olea europeae oil, Decyl glucoside, Coco glucoside, Cocamidopropylbetaine, Glycerin, Parfum, Inulin, Xanthan Gum.